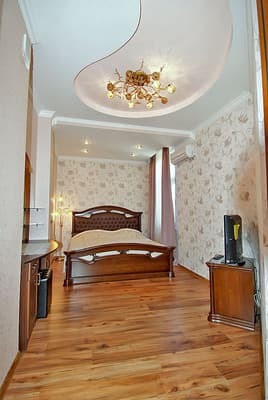 Elite apartments are located in the city center near the embankment. Lenin. 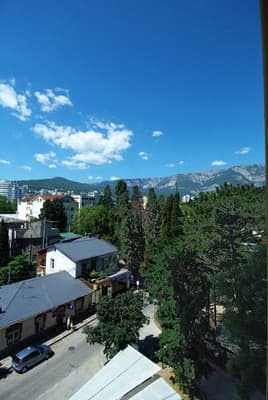 Located on the fifth floor, view of the mountains. Convenient location - just 5-7 minutes walk to the sea. 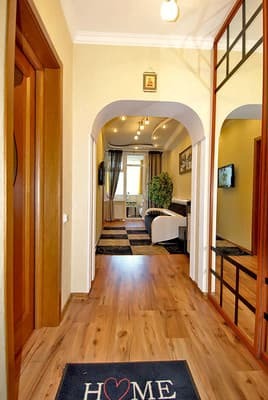 Three-room apartments with new furniture and household appliances, European-quality repair. Equipped with air conditioning. In each room there is a plasma TV. Kitchen-studio is equipped with the necessary equipment: stove, electric kettle, refrigerator, microwave. In the bathroom there is a bath, a bidet, a washing machine, personal hygiene items (toothpicks, brushes, shampoo, washcloths, slippers). Near the apartment there are restaurants and cafes. PRICES MAY CHANGE, IT IS REQUIRED TO RECEIVE INFORMATION FROM THE OPERATOR. Description of the room: Apartment with mountain views. Two bedrooms, living room, kitchen-studio. In each room there is a plasma TV. Kitchen-studio is equipped with the necessary equipment: stove, electric kettle, refrigerator, microwave. In the bathroom there is a bath, a bidet, a washing machine, personal hygiene items (toothpicks, brushes, shampoo, washcloths, slippers). Accommodation 4-6 people. Elite apartments are located in the city center near the embankment. Lenin. Only 5-7 minutes walk to the sea.